BUY BACK wins DO NOT count for Super Series points. First round Buybacks will be available for all Super Series events. Buy Back wins DO NOT count for Super Series points. 1st Round – Bye Run is awarded to the car with the best reaction time of ALL time trials. 3rd Round & On – is awarded to best reaction time of previous round. A car is only allow to receive ONE buy run. If a case of all cars have received a buy run occurs, it is up to Track Officials to make a decision based on race and round statistics prior. Launch controllers permitted providing they fluidly close to WOT from launch, use of Launch controller as down track throttle stop prohibited. 0 to 7.50 1/8th mile ET. 6.50 to 9.00 1/8th ET. 0 – 20.00 1/4 mile ET. 11.70 or 20.00 1/4 mile ET. 10.00 Or Slower 1/4 mile ET. ALL DRIVERS AND PARENTS ARE RESPONSIBLE FOR READING AND KNOWING ALL ST. THOMAS RACEWAY PARK AND IHRA RULES. LICENSE REQUIRED, Beginner, Advanced, Master. 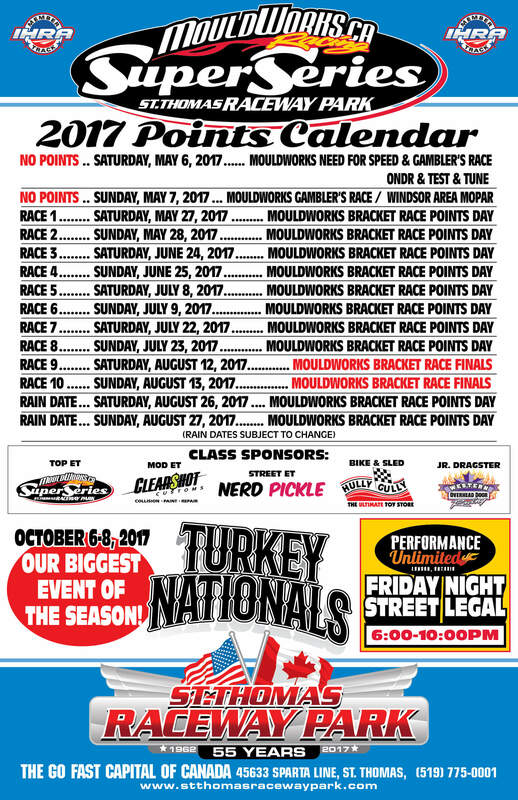 To participate in points or receive prizes, IHRA license must be shown. Crew members are prohibited from touching the vehicle after it is pre-staged. If a crew member touches a vehicle after it is pre-staged,the entry will be disqualified. Once the vehicle is pre-staged, crew member(s) must be behind the the vehicle and out of the view of both competitors. Dial-In must be clearly posted on the tower side of the vehicle. If dial-in is incorrect, DO NOT PRE-STAGE! Starter will correct the dial-in. If the driver unintentionally deep-stages, or does not courtesy stage, one pull-back is allowed ONLY IF APPROVED OR PERFORMED BY THE STARTER. DO NOT TOUCH THE CAR on the starting line without communicaing with the starter. Number One qualifier in each race will receive a plaque and $50 from Magical Dream Journeys. Qualifying is based on Reaction Times. Buy-Back race: First round is placed on a ladder based on the order that you lost in the point race. If you do not return for Buy-Back race, your opponent gets a Bye. If a tie occurs at the end of the season,the driver with the most First Place wins will be determined to be the Champion. Rookie Of The Year will be determined by point standings.